The book will be available from Amazon and Paradise Cay (USA) from 1 September. You can buy the book at one of Jimmy Cornell’s talks / book signing events. For a list of venues click here. Jimmy Cornell’s latest book is based on his extensive knowledge of offshore cruising gained from an experience that stretches over four decades. 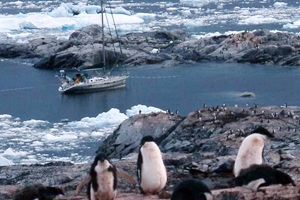 Jimmy has sailed over 200,000 miles in all oceans of the world, including three circumnavigations as well as two voyages to Antarctica and a successful transit of the Northwest Passage. As the founder of the ARC transatlantic rally, in the last 30 years Jimmy Cornell has organized 28 transatlantic and six round the world rallies. As organizer of these events, he has come into contact with over 15,000 sailors and the experience gained from dealing with so many different boats and sailors has been an invaluable source of knowledge of the global cruising scene that adds a special dimension to this book. 200,000 Miles deals with all essential aspects of offshore voyaging and long distance cruising. Every subject is dealt with in an informative and entertaining manner, backed up by telling incidents or anecdotes from the author’s wide-ranging experience. While primarily aimed at sailors who are planning or making preparations for a longer voyage, this book will also appeal to tested ocean navigators as well as weekend sailors. The book’s attractive style, with 500 excellent photographs from the author’s vast collection, should be equally appealing to dreamers. Approximately two thirds of the book deals with practical matters and covers all subjects of interest to anyone planning to leave on an offshore voyage. The other third of the book describes highlights from the author’s circumnavigations as well as voyages to Antarctica, a transpacific passage from Antarctica to Alaska, or the challenges of the Northwest Passage. The chapters alternate between the two, with one technical chapter being followed by a cruising narrative. 200,000 Miles is based on Jimmy Cornell’s book A Passion for the Sea published in five language editions in 2007 and now out of print. In the intervening decade Jimmy Cornell has launched a new series of offshore rallies as well as a new Aventura conceived by him as a yacht perfectly suited for both tropical and high latitude sailing. While preserving some of the main elements of the previous book, the newly gained experience of being once again in close contact with sailors taking part in his events, and the lessons learned from his two attempts at the Northwest Passage, have resulted in a more comprehensive and up-to-date book. In contrast to Jimmy Cornell’s previous books in which, as a professional journalist, he was careful to remain impartial, this book is a memoir in which the author does not shy from expressing personal opinions drawn from his own experience. He is also candid about the events that shaped his character and his passion for the sea. The book features many anecdotes from his eventful life, both afloat and ashore. Jimmy Cornell has written 24 books, most successful among them World Cruising Routes first published in 1987 and now in its seventh edition. It has been translated into French, German, Italian and Spanish. In total it has sold 200,000 copies making it one of the best selling nautical books in the world. Safety afl oat and ashore; how safe is cruising? Where do all the cruising boats sail?